The Apple Store in Palo Alto was reopened for business Monday, a day after burglars rammed a vehicle through the storefront and made off with thousands of dollars worth of phones and laptops. Four suspects were arrested later Sunday, but police said as many as 10 burglars were involved in the heist, and they are now searching for additional suspects. Dispatchers received the call at 4:38 a.m. of the crash at the store at 340 University Ave. The smashed portion of the University Avenue store's plate-glass window had been replaced with a large board Monday, and three plain-clothes security guards were watching the entrance. "The force of the collision punched a small hole that was big enough for people to crawl through," Palo Alto police Lt. Zach Perron said. Shaquin Ferguson, 19, and Erica White, 18, were arrested Sunday. The other two suspects arrested are juveniles, police said. The two teens, 16 and 17, have been taken to Santa Clara County juvenile hall. Their names are not being released because they are minors, police said. Ferguson and White were taken to the Santa Clara County jail on suspicion of burglary, vandalism and conspiracy. Ferguson, who does not have a permanent address, was on parole for weapons violations, police said. Investigators said more suspects are out there. "About eight to 10 people, after the car collided with the glass, were able to go into the Apple Store and help themselves to all the electronics that were there," Perron said. Witnesses told police that they saw multiple people running from the area after the crash. Police said they found a gray 2016 Kia Soul abandoned on the sidewalk in front of the store. The Kia had major damage, police said. Police did recover some of the stolen electronics. 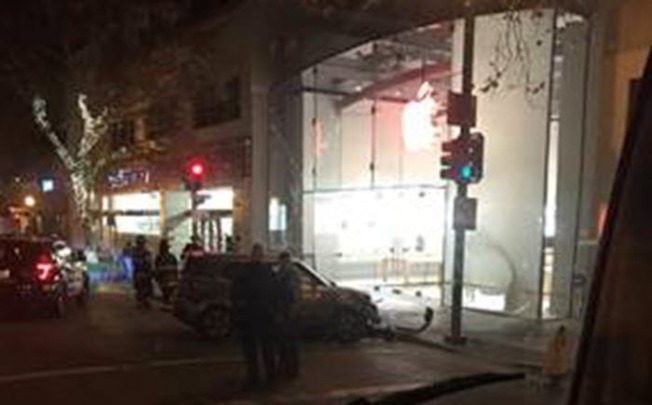 Sunday's heist follows a series of thefts at Apple Stores around the Bay Area. Last month, thieves robbed an Apple Store in San Francisco, and there was a similar robbery at the Burlingame Apple Store just last week. "Shoplifting and burglaries like these, especially this time of year, they’re not necessarily uncommon, unfortunately," Perron said. Police have not tied the Palo Alto suspects to any of the other robberies. Anyone with information about the burglary is asked to call police at (650) 329-2413. Anonymous tips can be emailed to paloalto@tipnow.org or sent via text or voicemail to (650) 383-8984.